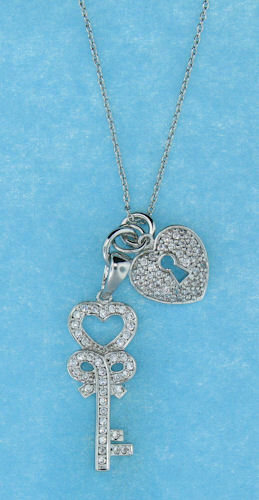 Cubic Zirconia Necklaces and more! Cubic Zirconia Key Heart Necklace 16"
Sterling silver necklace featuring an elegant cubic zirconia stone filled key and heart. Includes a 16 - 18 inch adjustable chain. Also includes a rhodium plate finish, which gives it its lustrous white gold appearance. This collection is amazing!